It was great to reconnect with so many old friends at EMS Today in Baltimore. The exhibit hall was packed and steady for the first evening and Friday morning. Later Friday and Saturday I got around the hall and said hello to everyone. I saw Jon Politis and we reminisced how we met at the very first EMS Today in 1984. It’s been many years since and is surprising how many of the early EMS pioneers are still around. There were not that many new EMS products as in years past. I did get to look at Durham County’s new Demers mini-mod on a Sprinter chassis. I really liked it. It has the Mobility-Track seating system and many of the premium features of recent Demers models. The Ferni iNX stretcher continues to astound. This year they played some amazing videos of it in action. The one I loved was iNX climbing over a cement guardrail effortlessly. 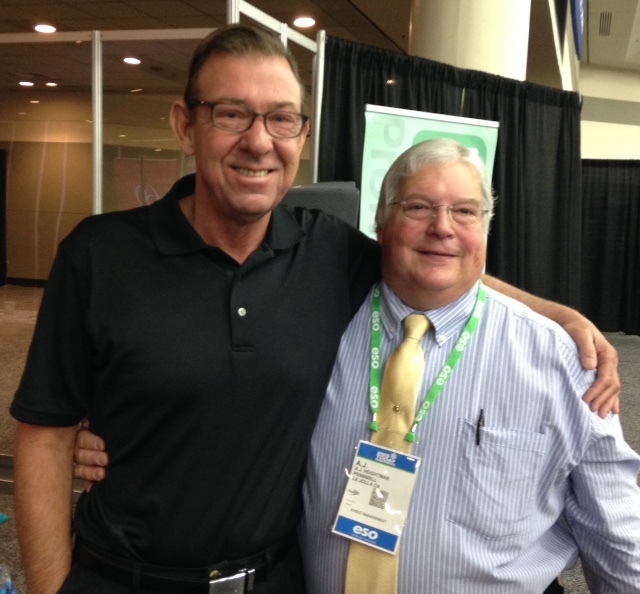 Here I am with my old friend AJ Heightman at the Convention Center. AJ has been a tireless advocate for EMS and is an inspiring leader. I’m sure Jim Page smiles from beyond knowing his legacy is in such steady hands.